Phone cards are products designed to connect you to local and international destinations at significantly lower rates. When you use a phone card, you're using a special access number ( 800 access number or, if available, a local access number ) to call anyone, anywhere in the world. 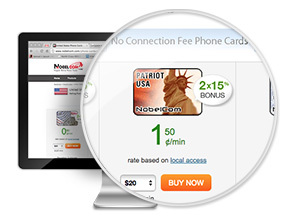 You initiate the call to a local or 800 access number and then you only pay a small rate to NobelCom, used to cover the international part of the call. TIP: you get the smallest rate when using a local access number. You can safely order your phone card(s) online and you will receive them in no time! You can always add more credit to your phone card, without the need to buy a new one! How do I use my phone cards? In order for you to make the most out of your calling experience, we've developed a number of features to use with your phone card.